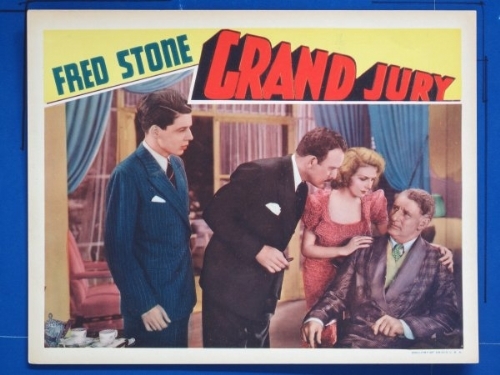 When John Taylor whose father is Commodore George Taylor, one of his town's founders, is selected to serve on a grand jury that is investigating the gang-related murder of a young man, he and the other jurors vote for no indictment out of fear of gang reprisal. Furious that his son's murderer is to be set free, Tom Evans shoots and wounds Joseph Britt, the suspected killer, in court. Later in jail, Evans tells George that he has evidence that would incriminate not only Britt, but several prominent townsmen as well. George relates this information to Steve O'Connell, a frustrated cub reporter who is engaged to George's granddaughter Edith, and Steve, in turn, leaks it to his newspaper. After he reads the subsequent front page article, Jim Hanify, a respected citizen and the leader of the gang, plots with Britt and his other men to have Evans released from jail and killed. Unaware of George's prior connection to Evans, Hanify chooses George to head a citizen's committee to have Evans bailed out of jail. Immediately after his release, Evans is shot and killed by Britt outside of George's house, and although Steve was a witness to the murder, he is scooped by his rival reporters and loses his job. To save Steve's career, George lies to the editor that Steve heard Evans' dying statement in which he revealed the names of his son's killers. Following another sensational headline, George receives a threatening telephone call from Britt, which prompts John to hire Davis, a bodyguard, to protect his father. Determined to catch Britt himself, however, George eludes Davis and eventually tracks the killers to their hideout. There George, who is eavesdropping through a door, mistakes a "Monopoly" game for genuine criminal plotting and, with Steve, ends up a captive of the gangsters. After Britt ties up George and Steve and then leaves, real money that was used in the "Monopoly" game blows out of the eighth-story window and is identified as stolen by a policeman. Just as Britt is about to shoot George and Steve, the police arrive and, following a brief gun battle, overcome the gangsters.